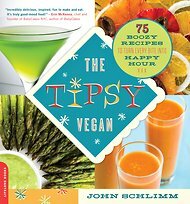 If you are among the skeptics who think vegan cooking is boring, maybe you’re just not adding enough alcohol. For Well’s Vegetarian Thanksgiving series, “The Tipsy Vegan” offers four alcohol-infused recipes, including a pumpkin soup spiked with rum, cabbage infused with sherry, potatoes roasted with vermouth and a stuffed acorn squash loaded with apple brandy. Mr. Schlimm says the amount of cooking and alcohol involved should make these dishes acceptable for diners of all ages, but parents may want to do a taste test if they are concerned about serving the dishes to children. “None of the recipes, except the cocktails, of course, have so much alcohol that it should be a problem for younger guests,” he says. 1. To prepare the pumpkin: Cut the pumpkin in half through the center and scoop out the seeds and strings. Reserve the seeds. Carefully cut away the hard peel with a paring knife — or, better, a vegetable peeler — and chop the flesh. You should have about 6 cups of pumpkin flesh. 2. In a large saucepan over medium-low heat, warm the olive oil with the sesame oil. Add the shallots and sauté them, stirring occasionally, until they are translucent, 3 to 4 minutes. Add the stock, pumpkin, potato and carrot, raise the heat to high, and bring the mixture to a boil. Reduce the heat to low, cover and simmer until the vegetables are tender, about 25 minutes. 3. Using an immersion blender, purée the soup until very smooth, or (carefully!) purée in batches in a blender with a towel placed over the lid. Stir in the brown sugar, molasses, orange zest and curry powder. Over low heat, stir in the soy milk, dark rum and Tabasco sauce. Taste carefully. Season with salt and pepper and add the nutmeg. 4. Toast the pumpkin seeds. Preheat oven to 250 degrees. In a roomy bowl, stir the seeds with peanut oil or canola oil — about a half cup of oil for every four cups of seeds. Add a nominal amount of kosher salt. Try adding a bit of thyme, oregano, cumin, coriander, cardamom and/or cayenne pepper, if you like. 5. Line baking sheet(s) with parchment paper. Spread the seeds in one layer on the sheets. Toast slowly for about an hour, checking them every 10 to 15 minutes and stirring if they are browning unevenly. Store the toasted seeds in tightly sealed containers lined with paper towels. 6. 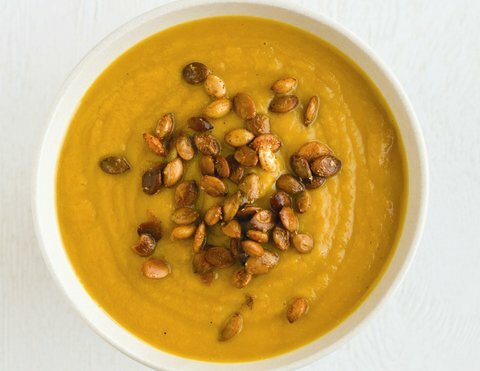 Serve soup in warmed bowls, and pass the toasted pumpkin seeds and vegan cheddar cheese for sprinkling. This sherry-infused salad could start, accompany or even punctuate a meal, or become a refreshing private lunch. 1. Using a mandoline or V-slicer, thinly shred the red cabbage. In a medium bowl, whisk the sherry vinegar and the sherry with the walnut oil, red currant jelly and sugar. Toss the cabbage with the vinegar mixture. 2. Peel the apple and slice it into thin discs on the mandoline. Cover the floor of a plate with the apple slices and sprinkle them lightly with the lemon juice to prevent discoloration. 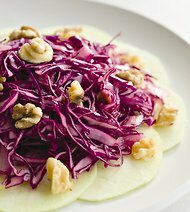 Top with the red cabbage salad and sprinkle with walnuts. Season to taste with salt and pepper. These rousing spuds start out looking wet and wild, but the mixture with vodka and vermouth cooks down to leave the potatoes crispy, crusty and tangy. 1. Preheat oven to 400 degrees. Line a large rimmed baking sheet with parchment paper. 2. In a large bowl, whisk together the mustard, olive oil, vodka, vermouth, horseradish, garlic, paprika, rosemary, salt, pepper, caraway seeds, cayenne and pepper flakes. Add the potatoes, and toss with your hands to coat. 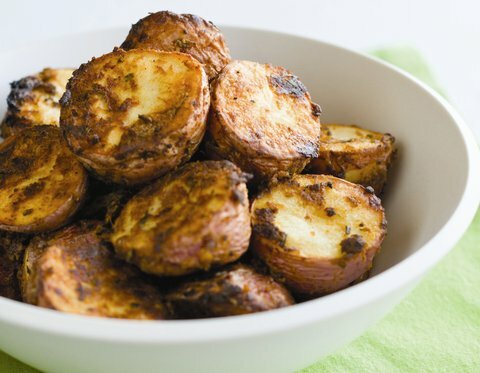 Dump the potatoes onto the prepared baking sheet, and spread them out in a single layer. Roast, tossing with a spatula a few times, until the potatoes are crusty on the outside and tender throughout, 50 to 55 minutes. 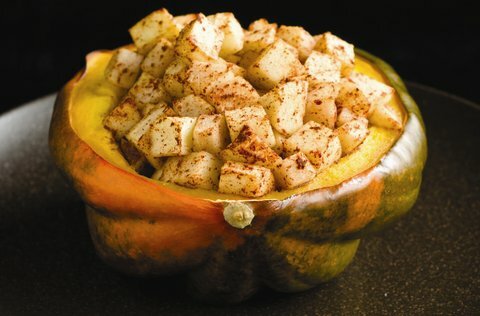 Sweeten your winter suppers with this loaded squash that can’t help but warm you up from stem to stern when partnered with pears, Granny Smiths, nutmeg, cinnamon and apple brandy. 1. Preheat oven to 400 degrees. Place the halved squash on a sheet pan, skin side down. If necessary, cut a slice from the rounded side to make the squash level. Place 1 teaspoon (or so) of the margarine in each half, cover with foil and bake until squash has softened, about 45 minutes. Remove from the oven. 2. Meanwhile, combine the diced pears and apples, and drizzle with the Calvados and lemon juice to prevent browning. Add nutmeg and cinnamon and stir until well mixed. 3. Spoon the mixture into squash halves, dividing evenly. Cover with foil and return to the oven. Bake until fruit is warmed through, about 15 minutes. Uncover and bake watchfully until fruit is slightly browned, about 5 minutes.